SUBHEAD: Texas consumes the most energy, Vermont the least. Per capita New York the least. Hawaii close. Image above: Mountain of damaged oil drums near Exxon refinery. 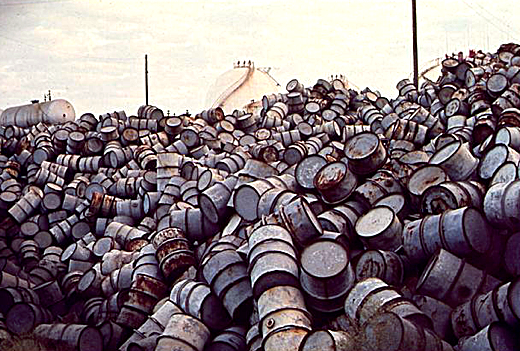 From (https://commons.wikimedia.org/wiki/File:A_MOUNTAIN_OF_DAMAGED_OIL_DRUMS_NEAR_THE_EXXON_REFINERY_-_NARA_-_546000.jpg). EIA’s State Energy Data System (SEDS) recently released 2015 data estimates for all 50 U.S. states and the District of Columbia. The estimates include data on both total energy consumption and energy consumption per capita, which is calculated by dividing total consumption by population. In 2015, Texas consumed a total of 13 quadrillion British thermal units (Btu), or about 13% of total U.S. energy consumption. Texas has consumed the most energy in every year since 1960, the earliest year for which EIA has data. California ranked second in energy use, with a total consumption of 8 quadrillion Btu, about 8% of U.S. total energy use. Louisiana, Florida, and Illinois round out the top five energy-consuming states, which together account for more than one-third of total U.S. total energy use. Total energy consumption by the top 10 states exceeded the combined energy use of the other 41 states (including the District of Columbia). Vermont was the lowest energy-consuming state in 2015 at about 132 trillion Btu; it was the only state with a lower consumption level than the District of Columbia’s 179 trillion Btu. Historically, Vermont has used less energy than any other state since 1961. Rhode Island, Delaware, Hawaii, and New Hampshire round out the top five lowest energy-consuming states, which together accounted for only 1% of total U.S. energy use in 2015. Overall, total U.S. energy consumption in 2015 was about 97 quadrillion Btu, a decrease of about 1% from 2014. In percentage terms, the states with the largest year-over-year percentage changes in energy use ranged from Minnesota, with a 7.6% decrease from 2014, to Florida, with a 3.7% increase from 2014. Thirty-five states and the District of Columbia had less energy consumption in 2015 than in 2014, led by states in the Midwest. The seven largest percentage decreases in energy use all occurred among Midwestern states: energy consumption in Minnesota, Michigan, Illinois, Wisconsin, Ohio, Indiana, and Missouri decreased by a total of 704 trillion Btu from 2014 to 2015, accounting for nearly half of the total decline among states that had lower energy use in 2015 than in 2014. 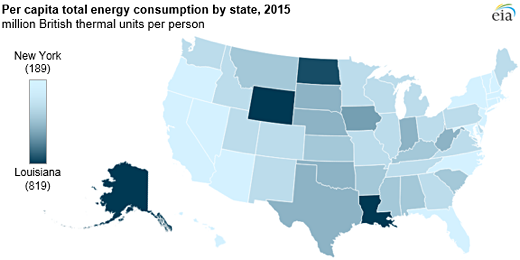 Image above: Total BTU consumption by state. From original article. In terms of total energy consumption per capita, Louisiana ranked the highest of any state, totaling 912 million Btu (MMBtu) per person in 2015. These rankings reflect the total consumption across all sectors in the state: residential, commercial, transportation, industrial, and electric power. Wyoming ranked second with 893 MMBtu, followed by Alaska (840 MMBtu), North Dakota (802 MMBtu), and Iowa (479 MMBtu). High per capita energy consumption in these states is largely attributable to industrial sector energy consumption, which accounts for more than 50% of all consumption in those five states. High production in the energy-intensive fossil fuel industry contributes to the high industrial sector consumption: Louisiana, Alaska, and North Dakota are all among the top ten states in crude oil production, while Wyoming is a leading producer of coal and natural gas. Iowa’s agriculture and manufacturing industries contribute to its relatively high consumption of energy in the sector. Image above: Total BTU consumption per capita by state. From original article. In 2015, New York had the lowest total energy consumption per capita at 189 MMBtu, followed by Rhode Island, California, Hawaii, and Florida. Again, relatively low per capita consumption reflects the relatively low industrial sector energy consumption in those states. Overall, the 2015 U.S. national average total energy consumption per capita was 303 MMBtu in 2015, about 2% lower than in 2014 and 1.6% lower than in 2000. EIA’s State Energy Data System contains a complete set of state-level estimates of energy production, consumption, prices, and expenditures through 2015.